Are you embarrassed about the appearance of your old, rundown blinds? If you live in an older home in Hollywood, FL, then it might be time to invest in home improvement projects. There are several things that you can do to improve the appearance of your home and maximize your spending at the same time. 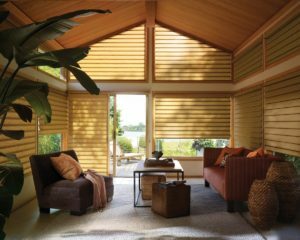 Talk to our team at Open House Interiors about the benefits of shutters, blinds, and shades. One of the best ways that you can upgrade your home is by replacing the window coverings. These products impact first-impressions when people come to visit. Plus, the way the windows are covered will impact your comfort and the function of your home. How Much Does It Cost to Install New Window Coverings? The cost of your investment will vary depending on the types of materials that you choose and the size of your home. For example, shutters are more expensive than basic blinds or shades. If you want to save money, then you might skip the shutters and choose basic blinds instead. But, you need to consider the durability available from the different materials. It often makes sense to spend a little more money to ensure the window coverings will last for many years. Don’t sacrifice the quality of your home by cutting corners with cheap materials. Also, remember that these new window coverings will have a positive impact on the value of your property. Beautiful shutters will increase the equity in your home. Plus, you will set a good impression when potential buyers come to visit. So, you can ask a higher price and sell the home more quickly. Do your research to learn more about the company that you choose to hire. It might be tempting to bring in an installation team that is new in the industry. But, you could be receiving low-quality products and poor installation services. The company reputation is a good indicator of the quality of service that you can expect. Research the company online. Also, call to ask questions so that you can learn more about licensing, insurance, and other important aspects of running a business. It can also be helpful to search online for the company name. This search can help you find reviews posted by other customers, providing insight into the experience that you can expect. Window coverings are functional to cover the glass and provide privacy. But, these products can also have a positive impact on the appearance of your home. If you want to create a home that you love, then you need to choose materials that match your interior design goals. Shutters, shades, and blinds can improve the aesthetics of your property. Look at the style of your furniture and the other features in the home. Then, choose window coverings to match the overall these. The style of your home reflects your personality. These details also create the first-impressions that people receive when they come to visit. Do you want to set a good impression? Then it is time to get rid of the old, run-down blinds. Spend a little bit of money so that you create a home that is beautiful and inviting to everyone who comes to visit. When you are choosing new window coverings, it can be helpful to choose a style to guide your decisions. Browse through pictures online and view our showroom for inspiration. You can find images that showcase your preferred design. Then, our team will work hard to source products that match. Once you find a design that you like, then you can customize the features. For example, you might see wood shutters that look great in the picture. But, instead of the natural wood color, you can choose white to correspond with your furniture and other types of décor. Do you need help choosing shades, shutters, or blinds for your home? Call us at Open House Interiors for assistance. We offer many years of experience in the industry, giving you access to a team of experts. We will ask the questions that are needed to understand your desires. Then, we can offer recommendations to help with your plan.